Hoerr Construction president Max Hoerr II continues the family legacy begun in 1914 when his grandfather, Philipp J. Hoerr, established P.J. Hoerr. Two generations later, Max began managing the underground division of P.J. Hoerr and introduced Central Illinois to its first directional bore rig. In 1994 Max spun off from P.J. Hoerr with the entire underground division, to begin Hoerr Construction, Inc.
Hoerr Construction, Inc. was founded on January 1st, 1994 with 12 employees. In its early days, our company performed directional boring, conduit installation, manhole replacement, and water and sanitary sewer construction. Customers included many municipalities and power companies like CILCO and Illinois Power, now Ameren-owned companies, and phone and fiber companies like AT & T, Sprint, Caterpillar, Ameritech, QST, Alltel, McLeod, Gallatin River and GTE. Beginning in the early 2000’s, Hoerr Construction experienced growth in the following areas: cleaning and televising sewers, and industrial cleaning. In 2005, the company became a licensee of CIPP Corporation, and started installing sanitary and storm sewer CIPP (Cured-In-Place-Pipe) lining. Five years later, in 2010, Hoerr Construction also started installing Permaliner and LMK lateral liners. In 2011, we began to use the applications of Line Stops & Insta-Valves in our work. In 2012, we installed our first LMK T-Liners and Vac-a-Tees. Most recently, we are getting involved in the water main inspection field, and the grouting industry. Currently, we employ approximately 45 employees, and continue to pursue opportunities in the underground construction field. Max P. Hoerr II is a third-generation contractor. He graduated from Purdue University with his bachelor’s degree in Building Construction and Contracting Technology in 1982. He began his construction career in his early teens working in the construction yard at P.J. Hoerr and has experience in building, highway, and utility construction. After graduating from Purdue, he worked at P.J. Hoerr in the field for five years as a laborer and foreman. In 1987, he moved into the office as a scheduler for manpower and equipment. In 1988, Max became divisional manager of the Underground and Utility division of P.J. Hoerr. In 1989, he led the company into directional boring and in 1993 into water and sewer construction. On January 1, 1994, Max spun the company off from P.J. 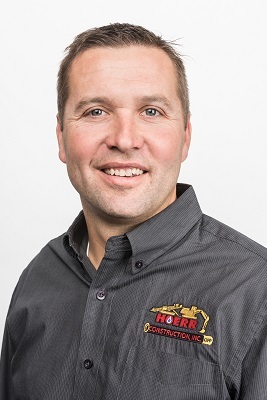 Hoerr, and founded Hoerr Construction, Inc. From 1995-2002, he managed the directional boring, fiber optic installation, water main and sanitary sewer installation projects. In 2002, Max ventured in to the sewer televising and cleaning market. In 2005, he became a licensee of CIPP Corporation, and began installing CIPP (Cured-In-Place-Pipe). In 2011, Max led Hoerr Construction into the Line Stop and Insta-Valve market, and the following year, into the process of installing LMK T-Liners and Vac-A-Tees. Max continues to seek out new technology, and implement it into the underground construction applications used by Hoerr Construction. He has acted as a board member and statewide chair of UCA since 2009, and is a member of Greater Peoria Contractor’s Association, NUCA, and NASTT. Max was born and raised in Central Illinois, and is married with seven children, and a growing group of delightful grandchildren. 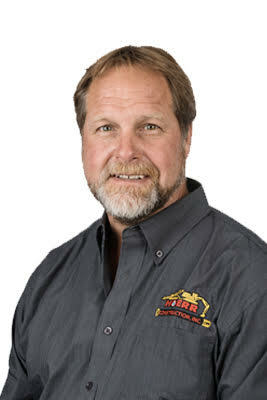 Bob Kilbride has been on board at Hoerr Construction since 1994. His diverse experience and well-rounded education helped pave the way for his role at Hoerr. After graduating in 1980 from University of Wisconsin at Stevens Point with a double major in history and psychology, he completed the management training program at Saga Foods after it was purchased by the Marriott Corporation. After ten years of employment in various Illinois food service management positions, Bob joined the office team at the P.J. Hoerr-owned Meadowbrook in 1990. The following year, he received an associate’s degree in business from Illinois Central College and began handling payroll, union reports and equipment budgets at P.J. Hoerr. A year later Bob passed the CPA exam. He received his laborer’s card in 1993 and began working in the field. He was instrumental in the planning of Hoerr Construction, Inc. Since then, his duties for the company have included worked in the field, performing bid work, and planning structure, budgets and manpower needs. Bob has played a major role in steering the direction of the company and maintaining a goal-oriented focus. A native of Ashland, Wisconsin, Bob is married with three children. Mike Kaisner has been involved with sewer lining and trenchless rehab at Hoerr Construction, Inc. since 2007. His job responsibilities include sales and estimating for our sewer rehabilitation work, as well as CIPP wet-out operations. 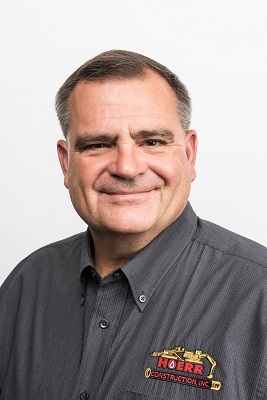 Mike has been involved in the construction industry since 1998 when he graduated from the University of Illinois with a degree in business management. David Steffen first began in the construction industry working for a custom homebuilder in the Peoria area while attending Bradley University. During his last year at Bradley, he began working part-time for Hoerr Construction, Inc. as a laborer. After graduating in 2003 with a BS in Construction and a minor in Management, he started full time with Hoerr Construction, Inc. as an estimator/project manager. 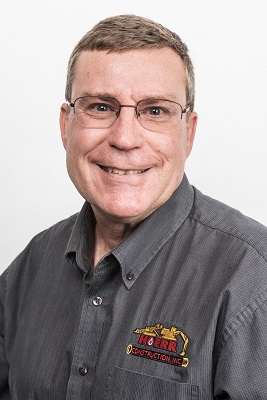 David’s current duties include estimating and project management for water and sewer construction projects as well as linestops and insta-valves. A native of Congerville, he is married with three children. Andrew Hoerr graduated from Eureka High School. After high school he went to Bradley University and graduated in 2013 with a bachelor’s degree in Construction Management. Andrew began working part time for Hoerr Construction, Inc. while in high school. Andrew worked in the yard doing various odd jobs. When he turned 18, he got his Laborer’s card from Laborers’ Local 165 and began working summers in the field with construction crews. After graduating college Andrew started working full time for Hoerr Construction, Inc. in the field with the CIPP lining crews, gaining valuable experience in trenchless utility construction. 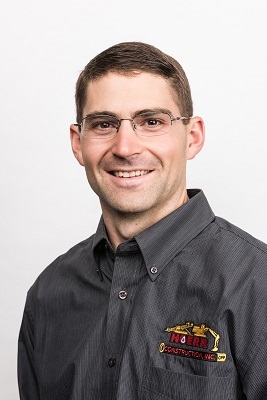 Andrew currently works in the field and has been helping estimate sewer rehabilitation and inspection projects. Andrew also has begun project managing of various sewer cleaning and televising projects. Andrew continues to grow and develop while learning all aspects of the family business. Andrew was born and raised in Goodfield, Illinois and currently lives close by. He is married with two children. 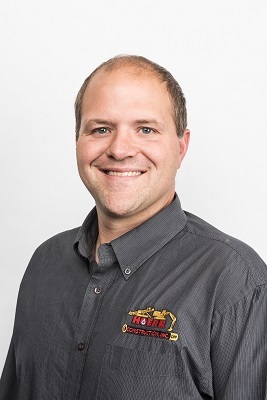 Dan Wiegand began his construction career with Hoerr Construction after graduating high school in 1998. He started as a Laborer in Local 996 on an open cut crew, he later changed to Local 165. Dan spent his early years at Hoerr Construction installing electrical conduit and manhole reconstruction. He worked his way from a laborer to a foreman and then a superintendent. He has been involved with the lining since its inspection with Hoerr Construction in 2005. Dan has been involved with the installation of over 2,000,000 feet of Cured-In-Place Pipelining (CIPP) as of 2017. He is currently the Lining Superintendent and his duties include project management, scheduling, and supervising the lining & CCTV crews and projects. Jim Pool started his construction career in 1984, working as a laborer in Central Illinois. Jim helped build fuel stations from start to finish. This included: burying the fuel tanks, piping from tanks to pumps, concrete flat work and constructing the building. He also learned to install oil, lube, air lines and vehicle lifts for dealerships and repair shops. In 1990, Jim started working for another contractor in the underground utility construction field. He installed sanitary sewer, storm sewer and some water main. Jim ran jobs for new subdivisions, which included installing underground utilities, curb and gutter, and paving roads. Jim has worked in commercial and residential arenas, doing many different tasks that included: foundation work, parking lots, pouring basements, installing septic systems, and much more. In 1997, Jim came to work for Hoerr Construction, Inc. He started as a foreman, running the Water & Sewer work. While working in the field, he had opportunities to work on duct banks and underground vaults for local power and telephone companies. 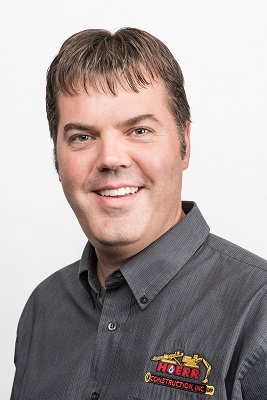 Beginning in 2018, Jim became a project manager. Jim’s years of experience helps Hoerr Construction, Inc. operate smoothly and tackle difficult jobs.